This journal presents papers written from every perspective, in all areas of economics, and is committed to free and open intellectual inquiry from diverse philosophical viewpoints. Each issue offers a mix of articles, book reviews, Eastern Economic Association Presidential Addresses, symposia and dialogues. 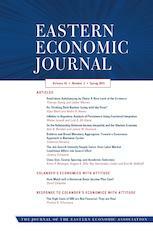 The Eastern Economic Journal (EEJ) is published quarterly, offering papers that are methodological and philosophical in approach, as well as empirical and theoretical. Recent articles span a wide range of topics, including the effect of paid family leave on retention of female faculty members; the feasibility of removing the penny and the nickel from circulation in the U.S.; and the effect of smoking bans on infant health. Founded in 1973, this is the official journal of the Eastern Economic Association. Stay up to date on events, announcements & new releases.